Next to Cookies and other site data and Cached images and files, check the boxes. Anyone who’s spent hours collecting data, knows that hand and arm fatigue is a real impediment to remaining efficient during the workday. Because the majority of our customers are working with our devices for several hours a day, all week long, we go the extra mile to ensure we are producing fatigue-free, ergonomic products. From the shape of the enclosure down to the placement of the hand strap, our handhelds are not only ultra-rugged, but ultra-ergonomic. With help from our experienced product design team, our enclosures are designed to minimize pressure points and fit in the user’s hand like a glove. To follow the shape of the human hand, our handhelds follow a theme of curved, flowing lines. Each depression or raised feature of our enclosures is there for a reason, and serve a specific purpose. Because our devices are highly customizable, including the ability to incorporate extended batteries, additional connectors, sensors, radios, batteries, etc., we go through a great deal to ensure any level of customized device remains ergonomic. The materials used to create an ergonomic product also play a major role in creating both a comfortable and functional handheld. We are constantly seeking out overmolding (rubberized) material to produce a non-slip surface for a secure grip on the product, regardless of the environment. As a team, we go through extensive material testing to ensure we are providing the best tactile grip for each user. Using material with grip also minimizes forearm fatigue by relaxing an otherwise tight grip and reducing the risk of dropping a device. And though we are hardly concerned about a dropped device, we also recognize that users are cognizant of taking care of their tools. Using the right surface materials allows users to focus less on holding the device, and more on the task at hand. Another important aspect is the placement and design of the hand strap. As an often mistakenly overlooked element in the rugged handheld industry, Juniper Systems puts much thought into the hand strap. The orientation of the hand while using a hand strap is critical to reducing forearm and shoulder fatigue. A hand oriented with the thumb up and the palm facing to the side of the user places the hand in the least strenuous orientation for the forearm and shoulder, which is why we design our hand straps accordingly. This hand strap design also lets users keep the handheld in hand while their arm is in a relaxed position, down to the side, without having to grip the handheld. 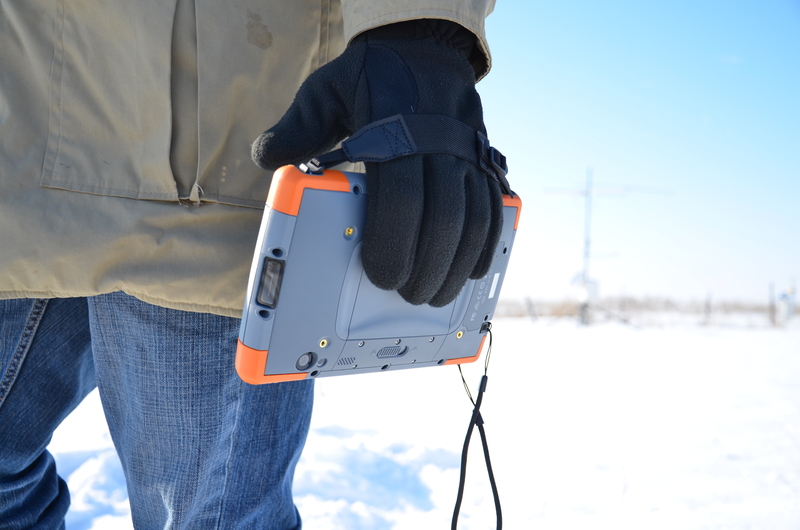 This allows users to travel to the next data collection event, without worrying about storing the handheld. An interesting ergonomic feature of the Mesa 2 Rugged Tablet, which we have perfected on past products, is what we internally call the “dog bone”. This feature is quite unique in the handheld and tablet computer markets, and plays a major role in providing a secure place for user’s fingers to latch onto when holding the product. This simple feature also significantly reduces the perception of weight. 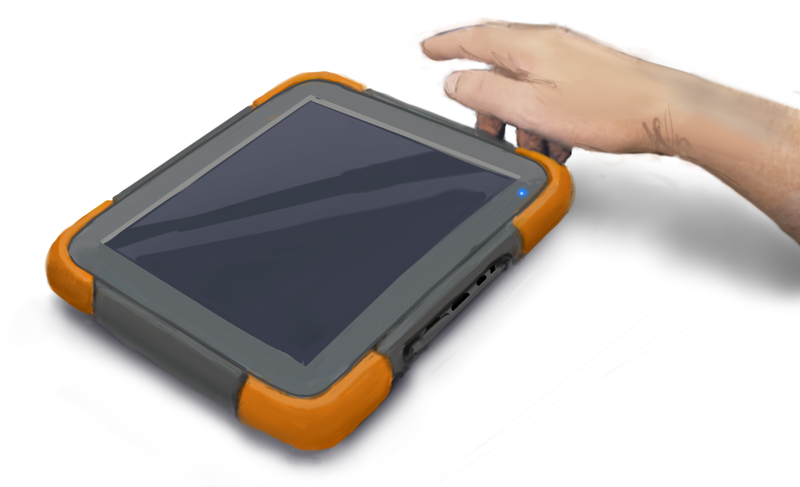 Problems with other rugged tablets available today is that they do not implement a “dog bone” feature and leave users with no place to grip their fingertips while using the tablet. At Juniper Systems, user experience is always top of mind. We are constantly seeking out opportunities as the manufacturer to make our customer’s job easier. With the use of strategic ergonomics in our products, we’re proud of the quality results we provide. And we’re not done yet. Our product design team is constantly researching and discovering new ways to improve the design of our handhelds, so our customers never have to slow down. For more information on the Mesa 2 Rugged Tablet, or any of our other ergonomically designed products, contact us at 435-753-1881 or sales@junipersys.com. This is discussed very well. Quickbooks also supported here very well. If you need any kind of Quickbooks related solution then you can contact us directly. Nice article. Mesa 2 rugged tablet is so amazing device.